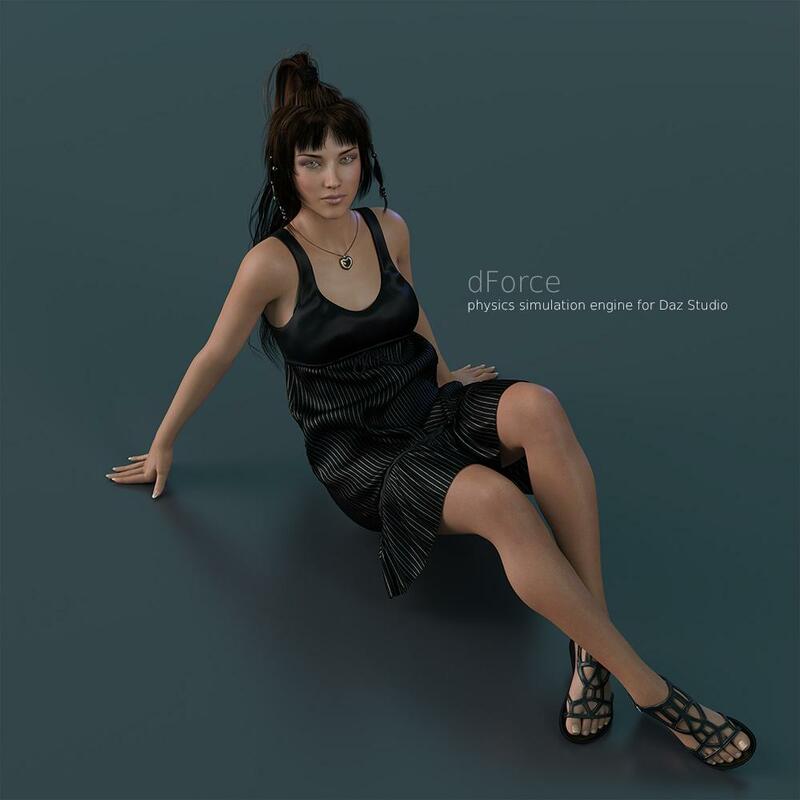 Daz 3D continues to enhance and improve Daz Studio with the introduction of dForce Physics. The first implementation will allow objects designated as cloth to simulate physical collision and interaction with other objects in the scene including a posed or animated figure. Other physics simulation types are expected to follow. Also click on “Tips” in the dForce simulation pane to be guided through a demo of cloth simulation. Q: Will all current content work with dForce? A: No. There are certain requirements of dForce compliant content including that it not contain elements that are physically impossible such as multiple pieces of geometry existing in the same physical space. In addition, dForce introduces additional surface parameters which must be set correctly for the objects to have the right attributes in order to behave appropriately. Content that is designed and tested to work with dForce will have “dForce” marked as compatible software. Q: I don’t see dForce compatible content for sale yet. Why not? A: Not all customers download the beta version of Daz Studio. Selling content that does not work with the released version of Daz Studio would cause issues for those customers. Since we expect the general release of Daz Studio 4.10 to be in October we have chosen to also hold off on launching dForce compatible content until that time. Q: Will I have to pay for dForce functionality? A: At this time, Daz 3D is making the dForce plugin and simulation functionality generally available and included with Daz Studio. Q: Will dForce compliant content work with older versions of Daz Studio? A: dForce compliant content relies on additional surface attributes designed to tell it how to behave when simulated. Content designed to rely on these attributes may or may not have all the traditional rigging associated with conventional content. Well looks like I'm gonna win my bet. Okay, since I don't have the beta installed, I should wait on the dForce starter essentials, right? "Clean up on aisles one, two, four and eight, pronto" ..
will there be modeling specifications for those wanting to create cloth? not that I am a great modeller but even a circle with a hole in it for a waist can be a skirt as long as one knows the limitations. There's a fair bit of information in the Start Here thread by Rob. I'm still trying to parse it all (Rob tends to write in 'information rich' mode that takes a bit of reading ). It looks like the starter essentials has sample scenes - wouldn't hurt to start by looking at them. You just made my Fall ;) But before I get TOO excited, what exactly IS "dForce compliant". And PAAAALEEEEEESE don't tell me you still have to have some plugin, license, blah blah blah bullcrap to use your own meshes for dynamics. I read the first post in the thread, but I'm still not clear on this. Yes, but it'll only work with the new beta. Built-in; looks like nothing else to buy. And looks like it will be fun to play with! Make sure that you have the latest video drivers installed, or in the case of older cards an Intel OpenCL driver which supports 1.2. As far as everything else go, read the Start Here thread. Do take your time in reading it. just make sure all your drivers are updated as Dr.Jellybean suggested. Oh man. Oh man oh man oh man OHHHHH MAN. Finally, a decent physics engine and one that doesn't require expensive proprietary hardware to boot! This is AWESOME!!! Just a tip for the adventurous souls out there. 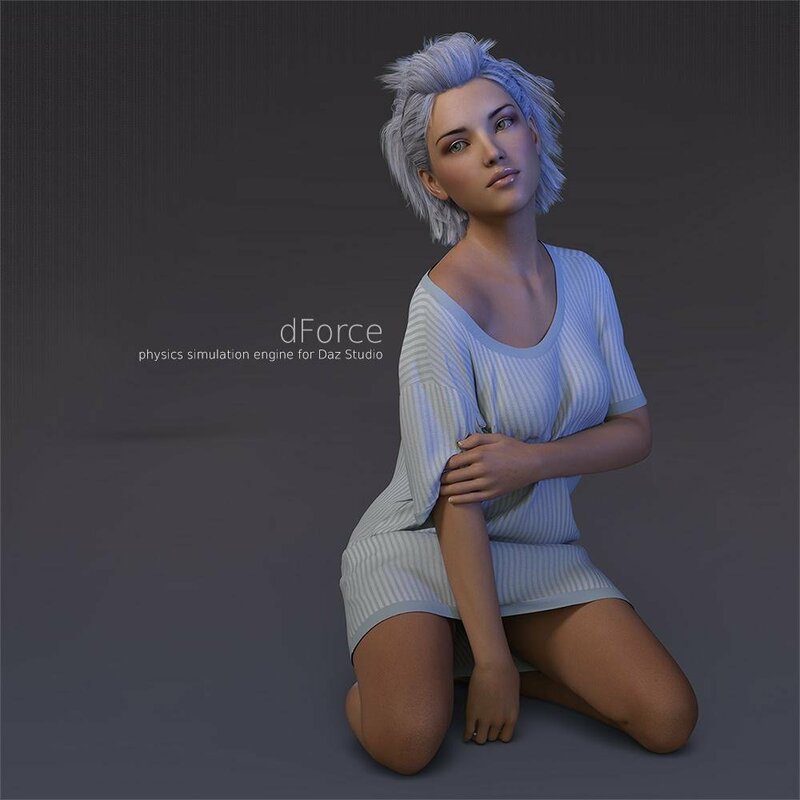 Most of my existing store content will work with dForce with a bit of adjusting in Surface settings, if you want to give it a try, as a first step turn Bend Stiffness down to .15 - .30 after adding dForce modifier to the garment. Set upper garment surfaces for instance: bodice,sleeves,collar to Dynamics Strength 0 to avoid excess stretch in those areas and give it a go! Thanks for the guidelines! Much appreciated. Just one thing .... Please, please, please ... NO threads entitled "May dForce be with you"
I haven't had time to test this yet, but I didn't see it mentioned if there's interactive mode somewhere. Like can you grab some part of the cloth mesh, and drag it with mouse or something? Yes, there is an interactive tutorial. It is on the Tips pane of the Simulation Settings pane. Looks great, an amazing step forward Daz! For those currently posting samples, how long does it take to run the simulation? I realize this will vary depending on the complexity of the set up, I'm just looking for some rough idea of the time required. E.g. to reach a point you're satisified with, does it double the total time for a render, or just add a small percentage or ??? It doesn't increase your render time at all. For me the simulation itself runs very very fast, generally well under a minute. This is going to be an awesome way to finally use some (maybe not all) dynamics that were originally made for Poser. That's incredible. Just tried it out with some freebies, and on a very basic level, it works really well. Moreso than certain off-site plug ins + the Optitex plugin. Once there's more documentation out there and how to operate this to its fullest potential, I can't wait to try it out with more things. As a Mac user who's made longing sighs and grabby hands at Window users who get to use VWD? Thank you, Daz. Thank you so much.